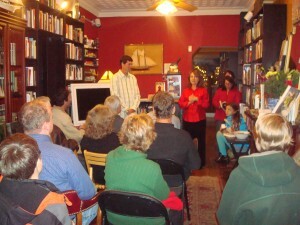 I was asked to present my work, as mountain and ski guide in the Alps, at the Annapolis Book Store in Annapolis, MD. Since the talk was at a bookstore, I didn’t just plan a typical show of images, routes and summits. It did include that, but I also tried to delve deeper into what climbing meant to me on a philosophical level. How, from the adventure, friendship and inspiration sprung. Friendship–through sharing physically and mentally challenging experiences and relying on your partner to help keep you safe, you create a bond. And Inspiration from the mountain environment,as you pause on the summit, you might be able to bring something back to your daily life, serenity, a sense of peace, a sense of awe, maybe feeling all parts of nature fitting together, a sense of place, and maybe a bond with the natural environment.